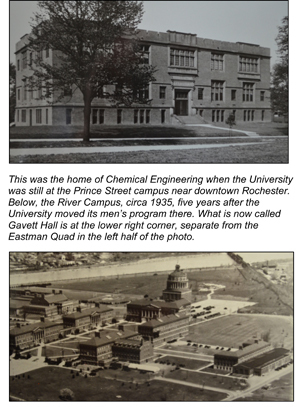 ChemE’s first home was in the Carnegie Laboratory on the Prince Street campus near downtown Rochester. When the University moved its men’s classes to the River Campus in 1930, ChemE moved into a new three-floor Engineering Building (now called Gavett Hall), along with mechanical engineering. ChemE’s current home has undergone substantial renovations since then. During the 1960s, for example, the University spent more than $800,000 to add 15,000 square feet to Gavett Hall and renovate much of its existing space, and another $1.5 million to build Hopeman Hall next door. This was in support of the new College of Engineering (established in 1958). ChemE continued to share space in Gavett with the Institute of Optics (which had been absorbed into the new college in 1961) and with MechE (which moved most of its program to Hopeman alongside the new department of Electrical Engineering). Even so, ChemE increased its square footage from 14,514 to 20,760 square feet. Among the bills for this project, saved in the University’s Rare Books and Special Collections, is one for 11 lab tables (either 60x or 72x24x36 high) and 5 balance tables with glass or stone tops – all for a total of $2,331 delivered and installed! 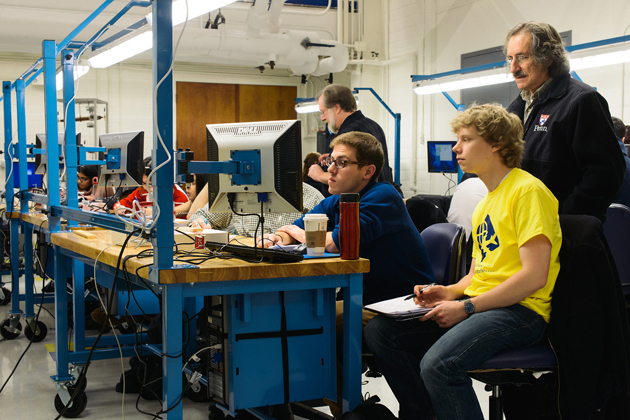 Recently, ChemE has completely refurbished its undergraduate teaching labs, as shown in photo below, with new equipment and mobile benches to maximize lab usage.